Usually kitchens tend to be at the heart of the home and the most-used room in the house. You need to be able entertain, cook, bake – but what happens when you don’t have enough room and are struggling for space in your kitchen? Storage – this is key with small kitchens. You can utilise wall space by building cabinet storage upwards to store pans, baking trays and small appliances such as toasters. This helps to keep your work surfaces free from clutter and give you more room for preparing food. Another option is to go for open shelving for cookbooks and crockery or wall hooks/magnetic strips for pots, pans and utensils. Flooring – this needs to be practical as well as stylish and large tiles are perfect for creating the illusion of space in a room and require less maintenance than smaller tiles. A light grey or beige colour is ideal to contrast against lighter coloured units and adds to the feeling of space. Décor – clever use of paint shades and types are a really good way to make your kitchen appear bigger than it really is. Pale shades with a glossy finish are good at reflecting light, so painting your kitchen cabinets or introducing some white accessories is a good idea. Using white tiles will also help with this and to keep your kitchen looking as fresh and clean. Underfloor Heating – the perfect solution for small kitchens, as this will be sufficient to heat the area and you can save wall space that would normally be taken up with a traditional radiator. If you have a small kitchen and want to maximise space and create a new look, then Dewhirst can help with the design, supply and fit of the kitchen that is just right for you. The decision to invest in a new kitchen requires a lot of thought, research and expert advice with careful consideration of all aspects of the design. This is where we can help. 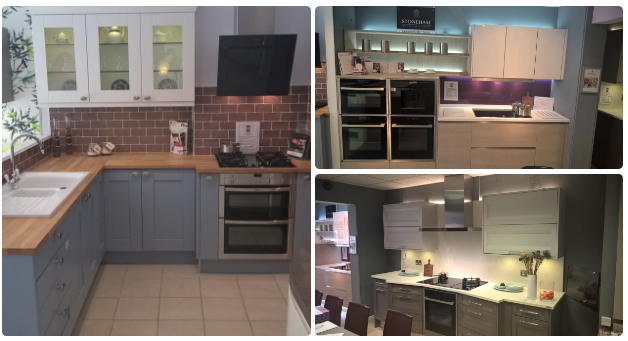 At our showroom on Granby Street, Leicester, we have displays of inspirational collections over 3 floors with the latest in traditional and contemporary designs. Our friendly team are on hand to offer advice and we also have a design service which can really help to utilise every inch of available space and create the kitchen of your dreams. Getting in touch with us couldn’t be easier – either phone 0116 255 5745 or complete our secure online contact form. We look forward to hearing from you.